MckMama and her precious Stellan need your prayers. Now I am joining Kimba in shutting it down. Going to focus on my firehubby who is coming off of a 72 hour shift. He is a good man and he deserves 100% of me today after working so hard for our family. Enjoy your time with hubby and Have a great weekend! I am off to a conference this weekend so see ya on MOnday! Thanks for you your comment on my last post...I appreciate it! Enjoy the time with your husband! Wonderful idea...have a great weekend. 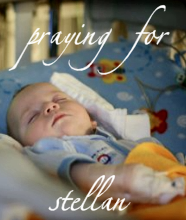 Still praying for baby Stellan! Enjoy your time with your hubby and have fun! I am praying for Stellan too. Have a great unplugged day. You know what, that is a great idea. I will finish reading up these posts and focus on my boyfriend for the evening. I am sure he will appreciate that. Not unplugging right now but will be from the time I go to bed in a little bit until Sunday night. Hank and I are going over to the farm for some peace and tranquility. Can't wait! Enjoy your hubby and have a wonderful weekend!!! 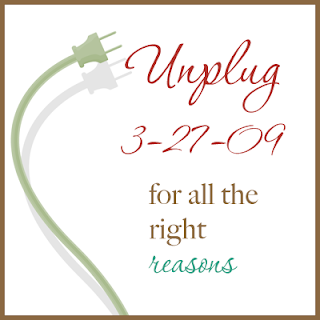 Have a great unplugged day!! Hope your weekend was as wonderful as you expected it...ours was wonderful too...we were in France Bourgogne visiting wine yards...we had a good time!